UPADATE Sep 4/09 this post is under revision! 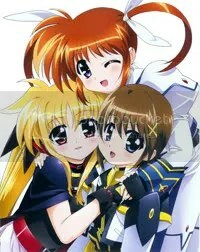 If you asked me to name an anime I truly and utterly hated, my immediate response would probably be ‘Mahou Shoujo Lyrical Nanoha.’ I found the original series to be utterly horrible in every way, in spite of it being the work of my favorite director, Akiyuki Shinbo. I’d heard from a number of people that Nanoha A’s was much better and would justify the first season. To my surprise, it went above and beyond mere justification and was in fact one of the outright best anime I’ve seen in a long time. I’d go so far as to call it a masterpiece. UPDATE Sep 4/09, this review is under revision! This is another review post. Meaning there will be a non-spoiler review followed by my spoilerific thoughts at the end. Please enjoy. Just as a note, I had no idea there was this epic cross-blog rewatch of this show going on. It’s pretty cool, and just the introductory posts helped me a lot with formulating this review since I was a little unsure of myself at first. The general theme in Darker Than Black is that everyone is being used. Every single character is being egged along by the characters around them who wish to fulfill their own purposes. They control others as if it were a game – however, it’s when the players start to make themselves a piece in that game that things get interesting. It’s a game of ‘who’s controlling who?’ and an exploration of what it means to be making your own decisions versus letting someone else make them. Through this theme, there is explored the idea of identity, social acceptance, the importance of will-power, and more all wrapped up in a cop-drama/action thriller with fantasy elements. 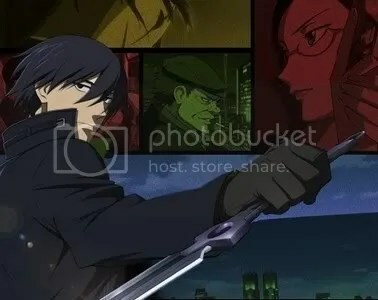 Decent at worst and excellent at best, Darker Than Black has a good amount to offer in terms of entertainment and a little bit to offer for thought if you look for it. Mostly it’s a show to chill out and enjoy when you want something on the darker but fun side. 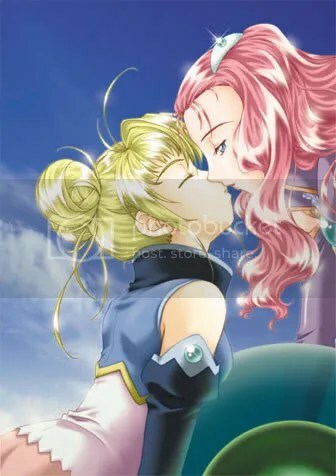 The first time I watched Simoun was in early 2007 when I had just gotten back into anime and it was one of my first new shows. I watched it on Crunchyroll, which back then was the shittiest possibly quality of streams imaginable. Like all anime I watched that early in my fandom, I lost memory of it quickly because of factors like me not really hearing voice actors, the shittiness of quality, etc. As such, when I later bought and watched the first DVD I was utterly shocked at how much better it was than I remembered in about every way. I knew that once I collected the DVDs it would quickly become one of my favorites. However, the most surprising thing about this rewatch is that I may not have understood the show at ALL the first time I watched it. Re-reading the posts I did at the time of watching, my opinions are so different that it’s almost like I didn’t watch the same show. So I’ve decided to divide this post into two sections. The first is one that you can follow if you haven’t seen the show, meaning it’s me trying to convice you to watch it, and the second is me talking about my own theories and other spoilerific content.